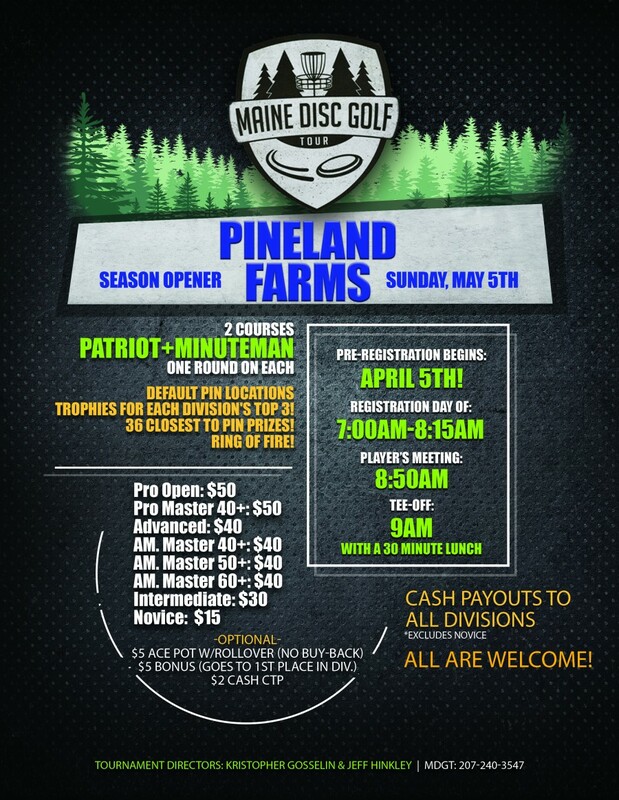 Hello and welcome to our 2019 Maine Disc Golf Tour Season Opener at Pineland Farms Disc Golf! 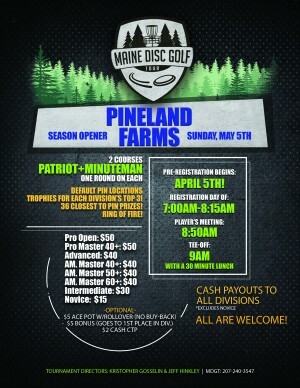 Pineland offers 2 fantastic courses which will challenge both your short and long game. Plenty of ace runs on the Minuteman, lots of space to let them rip on the Patriot. For lunch, be sure to grab a bite to eat in the Market Place. Great food and tons of options. Take the Maine Turnpike to Exit 63 (formerly Exit 11) in Gray, Maine. Bear to the right after the toll booth, toward the center of Gray Village. Stay in the right lane. At the first intersection, go straight through the light onto Route 115. Continue on Route 115 (East) for 1.6 miles, then turn left onto Depot Road. Continue on Depot Road for 2.8 miles to a stop sign. Turn left at the stop sign onto Route 231/Intervale Road, then immediately left again onto Morse Road. Turn right into the Pineland Campus. The Welcome/Outdoor Center is the first building on the right.